Some authors have the romantic vision of sitting down at their desk to write their book and then three months later happily typing “The End”. If it worked that way, my job would be much easier. I’ve always said that the most underrated part of ghostwriting is project management. Completing an 80,000-word manuscript is more work than most first-time authors understand. Those words don’t just magically appear on the page. Lack of good project management is one of the biggest reasons – if not the biggest reason – why book projects fail. Chances are, everyone reading this has done some sort of project management in their lives. It is similar no matter if you’re working on a small bathroom reno, a major corporate takeover, or a mission to fix the Hubble telescope. In general, project management entails successfully guiding a project from start to finish. What’s different though are the steps required to reach your goal and the expertise needed at each step. In that way, book project management is possibly completely different than on any other project you’ve worked on before. I’m not saying it’s more complex than planning a Hubble upgrade – I’ve never worked on such a project, but I’m pretty sure it isn’t. However, writing a book does require specific knowledge and expertise. Do research including reviewing your own notes, finding other sources, and/or conducting interviews – whatever it takes to gather the information you need. Create a book outline with chapter breakdowns and a general idea of all the topics you’ll cover. Create a writing plan to meet that deadline. This is different than a book outline. It is the nuts and bolts of how you’ll get your book written such as committing to writing 1,000 words per day, writing every Saturday morning, etc. Rewrite and revise the manuscript. There’s an old adage that books aren’t written, they are rewritten. This is a good thing to know upfront so you can budget for a significant amount of rewrite time. The number of drafts you’ll go through will depend on many things, but five or more is not unusual. Book project management then is devising ways to make sure you stay on track. For example, you need strategies to help you stick to your writing plan along with contingency plans. What happens if you’re away on business one Saturday? Will you still be able to write, or will you need to reschedule? Do you even have room to reschedule? Further, there will be at least one point and likely many points during the writing process when you will want to give up. (If this doesn’t happen to you, please email me – I want to know your secret!) You have to work out ways of pushing through to the end. It’s not unusual, especially for first-time authors, to get bogged down in the middle. This could be because they’re losing interest, they’re getting discouraged, or life is simply getting in the way – new job, new house, new baby, new relationship, you name it. Knowing what’s coming and planning around those traps will help you avoid them. The title of this blog post is tongue in cheek except the last part. Poor project management really can kill your book even before it’s finished. For every book on the market today, there are thousands languishing away in a desk drawer or some lost hard drive, abandoned long before completion. In almost every case, it sits there because the author didn’t see it through to the end. One of the best reasons to hire a ghostwriter is that they are experts at keeping your project on track. They know how to gather information effectively, how to outline and organize your book. They know what pitfalls are ahead and how to avoid or step over them. They know what it takes to write a book from beginning to end. It’s no wonder that non-professional writers turn to ghostwriters so often. Plus, you get all the other added benefits of working with a professional ghostwriter – clear, concise, polished writing that connects with your reader. Keep in mind that a ghostwriter can play several different roles. They can write the whole book for you, of course. But some might be willing to come onto the project as an editor, taking your first draft and polishing it up. Others might agree to function more as your writing coach, providing you with feedback and helping you keep on track. 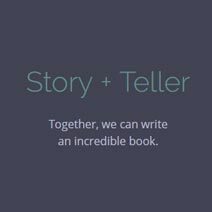 The bottom line is this: with a ghostwriter helping you, you significantly increase your chances of getting your book finished and into the hands of readers. Graham Strong is a professional ghostwriter, freelance marketing writer, and freelance journalist. Since 1995, he has written – and ghostwritten – thousands of articles, brochures, web pages, ads, whitepapers, newsletters, annual reports, and more. Graham launched the Strong Ghostwriting website to highlight his book ghostwriting services to clients. Contact Graham to find out how he can help you write your book. Author: The copyright owner and the one with the "by" in front of the name (you). Often the person who comes up with the subject matter and ideas, and provides the expertise. The person who makes the final decisions. Writer: The professional who helps take your ideas and turns them into a compelling, page-turning book (me). Will also help with organizing the content, providing suggestions for angles the author may not have considered, and the all-important project management.